Involvement in sports is good for kids – robust health is dependent on physical activity – but participation in sports does present some potential for injuries. Parents and coaches must do all that they can to keep kids injury-free during workouts practices, and games, making sports both fun and safe. While there are many ways that kids can get injured while playing sports, many of these injuries stem from a few basic causes. First, when kids are teamed according to age, rather than size and ability, smaller children are at greater risk. Children’s growth patterns vary by individual – a group of kids all the same age may differ from one another dramatically in height and weight, even if they will ultimately grow to be approximately the same size. Another common cause of sports related injuries in kids results from the failure to properly use safety equipment. 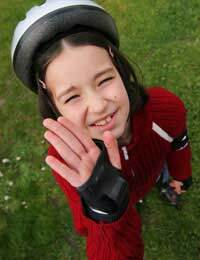 Additionally, overuse injuries are common amongst kids, especially when they focus exclusively on one favoured sport. Finally, failure to follow simple preparation guidelines, such as warming up and cooling down can put student athletes at risk for injuries. Insist upon the use of safety gear. Helmets, face-masks, protective eyewear, and mouth guards, along with wrist, elbow, and knee pads can make huge differences in the safety of kids while playing sports and their importance should not be taken lightly. While some sports injuries are superficial, others can have devastating consequences, so parents and coaches must provide safety gear that is in good condition and properly sized for each participant. It’s also important that playing surfaces and sporting equipment are well maintained. Provide responsible, adult supervision. Kids may not always have the best judgment when it comes to risk-taking behaviours, so parents must see that their children are properly supervised while playing sports. Young children, especially, should be watched closely as they have not yet developed the common sense necessary to stay safe. In older kids and teens, parents and coaching staff should be alert to signs that the kids are not attempting to continue playing after an injury – the competitive nature of some sports (and some kids!) may lead kids to downplay the extent of their discomfort in order to continue a game. Warm up, cool down, and stay hydrated. Kids are often anxious to bolt onto the field and get in the action, but it is important for them to do a little warming up and stretching before embarking on a full throttle workout. Starting out properly hydrated is important, too, as is maintaining hydration by drinking water every 20-30 minutes during active play. Once a game or practice session has ended, kids should be allowed time for a cool-down and a replenishing drink and snack. Know your game. Sometimes, simply being uninformed as to the specifics of how a game is played can increase a kid’s chances of getting injured. Parents and coaches need to be certain that student athletes are prepared for the types of actions that they will encounter during a game so that they will not be caught off guard. Never play through pain. Professional athletes are expected to continue playing, even when they’ve sustained injuries. For those who are earning enormous salaries, this may be an acceptable policy, but it is never okay for kids. Pain is a warning sign that deserves attention – parents and coaches must insist that kids and teens who have been injured (even mildly) give themselves time to heal before resuming their full schedule of activity.